Daniel Cavanaugh has it all—a lucrative career as a lawyer, a gorgeous fiancee, and his future mapped out for him. So why is he feeling increasingly dissatisfied with his life? When the assignment to handle his lat grandmother’s estate takes him to the California coast, Daniel welcomes the escape. Staying at the nearby bed-and-breakfast isn’t really his style, but he soon realizes the inn may hold the key to the answers he’s been seeking. Spindrift Cove has few opportunities for a young unmarried woman like Sarah Michaels. Even so, she enjoys her solitude as owner and chef at the Neverland Inn. She thrives on catering to the needs of her guests and treating them to her fantastic cooking. But when Daniel walks through her door, he immediately tests her patience. Though he is handsome and well-bred, she finds him insufferable. 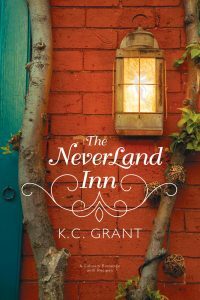 Soon, however, the tranquility of the inn works its magic, and Daniel and Sarah forge a sweet and unexpected connection—until the life he left behind in the city demands his return and it seems that a happily ever after may not be on the menu after all. I loved the idea of The Neverland Inn. I’m always looking for new recipes to try. So having this book have them incorporated with the story sounded fantastic! I definitely want to try some of the recipes in this one. But I think the idea was better than the finished product for me. This book’s main characters are Daniel and Sarah. Daniel is a lawyer who basically hates his life. His parents are frustrating and not loving. And his girlfriend, while beautiful is terrible. Daniel spends the whole first part of the book almost in a fog. His grandma has just died and because of his job, he ends up being the one to have to take care of her estate. Maybe it was the way he was in a fog, but the whole first part of the book seemed a bit sleepy to me. I liked Sarah. She is the owner of the bed and breakfast, The Neverland Inn. She works hard to care for any customers she has. I loved the way she had all kinds of fun recipes. Her life revolves around her inn, her dog and the kids she helps at the local school. Sarah’s parts of the story were better for me than Daniel’s. I did like the plot as it got nearer to the end of the book. It didn’t seem as sleepy and there was a bit of a mystery that needed solved. I also liked the recipe box and the way it kind of tied everything together. The ending made up for the sleepy beginning to me. K.C. Grant was born in rural Idaho but has made Utah her home for most of her life. She lives in northern Utah with family. After serving a full-time, Spanish-speaking mission, she returned to Weber State University, where she received her bachelor of arts with a double major in English and Spanish. She has traveled extensively throughout Mexico and studied briefly at a local college in the state of Michoacan. Over the years, she has been a frequent contributor to several family/home-oriented magazines, such as LDSLiving, Natural Life, The Washington Family, and BackHome and has also written for the Deseret News and KSL. She is an active member of both the League of Utah Writers (where she was a chapter president for three years), LDStorymakers, and the Association for Mormon Letters. To learn more about the author, visit her website at www.kcgrant.com.